For FY2018, Top Glove achieved record-breaking Sales Revenue of RM4.21 billion, surpassing the RM4 billion threshold and representing a 23.6% growth from FY2017. Profit Before Tax was also at an all-time high of RM522.7 million, an exceptional increase of 36.4% compared with FY2017, while Sales Volume (quantity sold) reached its peak, surging 26% year-on-year. Top Glove also delivered a commendable performance for 4QFY18. It achieved Sales Revenue of RM1.22 billion, the Group’s highest ever Sales Revenue attained within a single quarter, a 34.9% increase year-on-year. Profit Before Tax came in at RM142 million, an improvement of 43.3% compared with 4QFY17. Meanwhile, Sales Volume (quantity sold) grew an exceptionally high 27% versus 4QFY17. A smaller growth in Profit After Tax was recorded as the income tax provision in 4QFY17 was lower, with FY2017 tax incentives being taken up only in 4QFY17. However, for FY2018, tax incentives were taken up over the 4 quarters. The Group’s favourable results were attributed to its continuous pursuit of internal improvements. In particular, the application of advanced technology enabled quality and efficiency to be improved considerably, whilst also contributing to a reduction in manpower requirements. Additionally, the strong demand growth also accounted for the higher Sales Revenue, with the resulting higher utilization rate also leading to better Profit Before Tax (PBT) as well as EBITDA and margins for FY2018. Raw material prices for FY2018 were mixed. Natural rubber latex prices averaged at RM4.51/kg, down 21.7% against FY2017, while the average nitrile latex price was USD1.13/kg, up 2.7% compared with the previous financial year. As the Group leverages Aspion’s technology and surgical glove expertise, while tapping on its own extensive customer base, manufacturing and procurement capabilities, it is confident that Aspion’s contribution towards the enlarged Group will be enhanced moving forward. The Group achieved Sales Revenue of RM1.22 billion, a 10.6% increase quarter-on-quarter. Profit Before Tax also registered higher at RM142 million, representing an improvement of 5.8% compared with 3QFY18. Meanwhile, sales volume grew 6% versus 3QFY18. 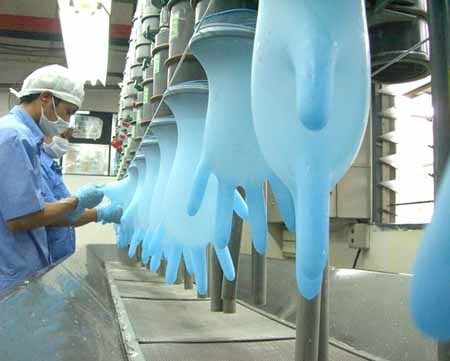 The improved performance was attributed to improvements in higher gloves volume sold, production efficiency and quality, coupled with new capacity coming onstream and strong demand growth. The average natural rubber latex price eased 2.7%, while the average nitrile latex price was on the uptrend, increasing by 13.9%. To ensure it is well-positioned to meet the robust global demand for gloves and achieve its ambitious Fortune Global 500 dream, Top Glove will continue to pursue strategic expansion. In progress is the expansion of several existing facilities: F32 (Phases 1 & 2 to be completed early and end 2019 respectively), F33 (to be completed early 2019) and F5A (to be completed end 2019). Meanwhile, its newest factory F8A in Thailand, is scheduled to be operational early 2020. These will boost the Group’s total number of production lines by an additional 98 lines and production capacity by 9.8 billion gloves per annum. By 2020, Top Glove is projected to have 746 production lines and a production capacity of 69.1 billion gloves per annum. Top Glove is also looking to expand its operations to Vietnam and has entered into an agreement to acquire a piece of land for a factory which is expected to commence operations within the next 2 years. In support of its ambitious growth agenda, Top Glove will also continue to explore inorganic expansion via mergers and acquisitions, as well as new set-ups in related industries in order to grow faster and more efficiently. The Group also proposed to undertake a bonus issue of 1,280,229,124 new ordinary shares in Top Glove Corporation Bhd on the basis of 1 bonus share for every existing Top Glove share held on the entitlement date, which was approved at EGM held on 10 October 2018. The said EGM also approved a proposal to issue guaranteed exchangeable bonds to raise funds for the repayment of bank borrowings, as well as amendments to the Company’s Constitution to facilitate the issuance of bonus shares for the bonus issue. Underscoring the Group’s commitment to enhance shareholder value, the Board recommended a final dividend of 10 sen per share (before bonus issue), subject to shareholders’ approval at the upcoming AGM in January 2019. This would bring the total FY2018 dividend payout to 17 sen per share, an increase of 2.5 sen or 17% over FY2017, representing a net profit payout ratio of 50%. Top Glove remains highly optimistic of prospects moving forward, given the steady global glove demand which is set to grow at about 10% yearly.